Ekweremadu, who had earlier warned of a possible military takeover in Nigeria, opened the can of worms through his personal twitter handle@Ike_Ekweremadu, predicting a high level of violence and thuggery in the country’s next general election. 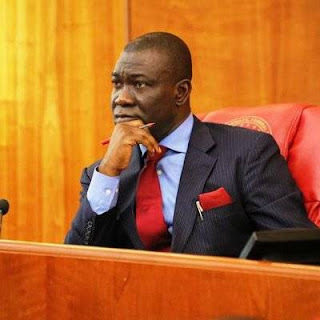 “With 2019 around the corner, Arms are being imported by Politicians”, Ekweremadu tweeted. The deputy senate president asserted that he warned those importing the weapons that their action would destroy the country and lead to a big loss for the people. Ekweremadu’s allegation is coming as the Senate begins investigation by Senator Dino Melaye on Thursday that Governor Yahaya Bello of Kogi State imported restricted security gadgets without obtaining the end user certificate from the National Security Adviser (NSA), as the law demands. The Senator representing Kogi West senatorial district in the National Assembly who made the accusation at the Senate’s plenary said he had sufficient proof to show that the items were imported without the NSA’s knowledge. He added that the Nigeria Customs intercepted the items, which were in the custody of Nigeria Aviation Handling Company of Nigeria (NAHCO). He also asked the Senate to instruct the James Manager led-Ad-hoc Committee to take the issue as part of their assignments and to ensure that they were still in the custody of NAHCO. The Senate had earlier set-up a committee headed by Senator James Manager Delta PDP, to carry out a detailed investigation of attacks during empowerment programme organized by Senator Ahmed Ogembe, in Okene, Kogi state last weekend. “I also urge them to move to NAHCO this afternoon to ensure that those items are still in their custody,” Melaye said. The Deputy Senate President who presided over the plenary told the Ad-hoc committee to investigate the claim and turn in its report as quickly as possible.